The Microsoft Dynamics Lifecycle Services (LCS) team is happy to announce the immediate availability of the release notes for LCS (March 2018, release 2). In this release of LCS, we have added the ability for customers to modify and delete any new phases that are appended to a methodology. This applies to methodologies in Implementation projects and Create and Learn projects. We have received feedback that new phases added to a methodology were locked and prevented users from making further changes to the phases. We addressed this issue by ensuring that any new phases that are added to a methodology are not locked by default, which means that you can continue to make edits. With this release, we have improved the workflow of application upgrade requests. When the Microsoft Service Engineering (DSE) team completes the upgrade process, the service request status will change to Ready for Validation. The system is available to you at this stage. Customers will validate and then change the status of the service request to Validation Successful or Validation Failed. This new workflow enables a rollback of the upgrade even after an upgrade is successfully completed by DSE. If the status is changed to Validation Failed, a rollback of the upgrade is initiated. For more information on application upgrades, refer to scenario 3 in the topic, Process for moving to the latest update. Manage users for Global (restricted) scope solution at solution level, such as add or delete. This feature is available through Preview feature management. Click the Preview feature management tile to access the features available for preview. Select the preview feature, SharedToolAsset – Solution package, and set Preview feature enabled to Yes. Dynamics 365 – Translation Service (DTS) introduced a new preview feature, Dynamics 365 Translation Service – Documentation Translation Support. When you enable this feature, you can submit a translation request for a Microsoft Word (.docx) file in DTS. 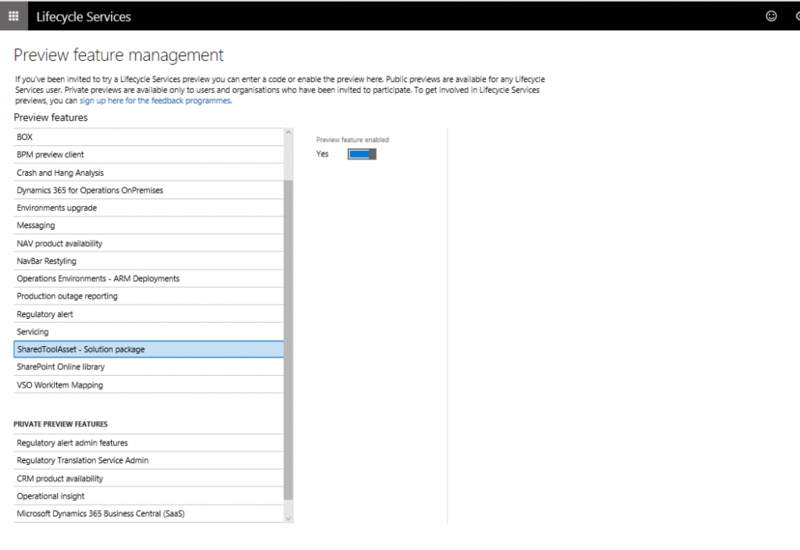 To enable this feature, go to LCS Preview feature management, select Dynamics 365 Translation Service – Documentation Translation Support, and set Preview feature enabled to Yes. To create a new request, go to the DTS dashboard and select to create a new request. In the New translation request window, select Documentation in the File type field to proceed with a .docx file translation request. After the request is submitted with source .docx files, DTS will generate the target language .docx files in a side-by-side text review format and the final output .docx in the source file format. You can review and edit the translations, and regenerate the files in the target language with your edits included.